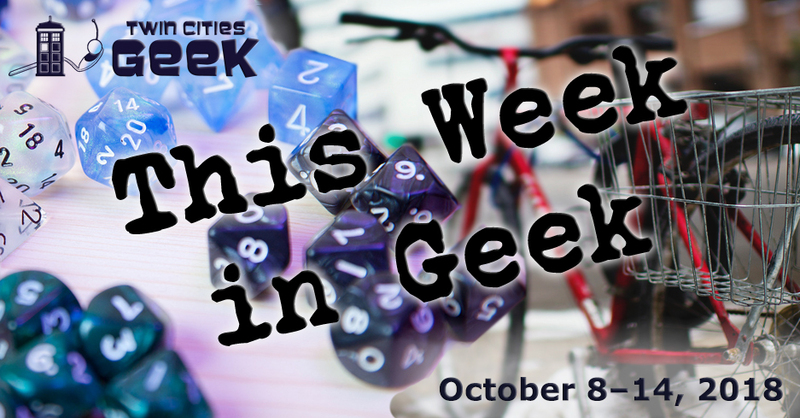 Welcome to This Week in Geek, your guide to events of interest to the Minnesota geek community for the week of Monday, October 8th to Sunday, October 14th. When: Monday, October 8th at 6:30 p.m. When: Monday, October 8th at 7:00 p.m.
Get your GlitchCon on with this launch party, replete with locally crafted projects from Minnesota game makers, good company, and refreshments. Games will run the gamut from intense multiplayer battles to dramatic adventures and more; there’s a full list of games on the event website. Tickets are free, and there will be a cash bar on site, and even better: you don’t need to bring any quarters! This event is presented by Glitch, and is made possible in partnership with Rewire.org, Twin Cities PBS, and the Knight Foundation. Enjoy an enchanted forest full of jack-o-lanterns, for a family-friendly walk sure to get everyone in the Halloween spirit. The trail includes over 5,000 illuminated pumpkins of different sizes, shapes, and faces throughout the forest. Between the pumpkins, the fog, and the musical vignettes, this trail will make a lovely evening. Tickets start at $18 for adults, with a variety of discounts available based on age and zoo membership. When: Monday, October 8th at 9:00 p.m.
John Carpenter’s cult classic is a geeky dream, featuring weird drifter truckers, immortal sorcerers, some kind of Beholder rip-off right out of the Dungeons & Dragons Monster Manual, and a lead character who is actually the sidekick to the much more capable, but out of focus, hero of the film. This is an 18-and-up showing, but children over the age of six are allowed if accompanied by an adult. Tickets are $7.58. When: Tuesday, October 9th at 12:00 p.m.
Geeks with a passion for gaming, the arts, and the way that art combines to make games won’t want to miss GlitchCon. GlitchCon is an arts and cultural festival focusing on “makers, doers and thinkers in digital games.” There will be a lunch and keynote, a variety of sessions and panels throughout the day, a happy hour, and a closing ceremony. This event is free, and the keynote speaker will be Freya Holmér, co-founder at Neat Corp, and creator of Shader Forge (a tool for Unity). When: Tuesday, October 9th at 7:30 p.m.; Wednesday, October 10th at 7:30 p.m.; Thursday, October 11th at 10:30 a.m. and 7:30 p.m.; Friday, October 12th at 7:30 p.m.; Saturday, October 13th at 1:00 p.m. and 7:30 p.m.; and Sunday, October 14th at 7:00 p.m.
Minnesota playwright Barbara Field penned this captivating retelling of Mary Shelley’s classic of science fiction to celebrate its 200th anniversary this year. This retelling focuses on the ethical limits of science and the human imagination as Dr. Frankenstein prepares to confront his creation in the Arctic Circle. Tickets start at $2. If you’re looking to plan more Frankenstein-related events, check out our article here. When: Tuesday, October 9th at 7:30 p.m.
Come and experience YogaQuest, a blend of yoga and fanfiction storytelling led by certified yoga instructors. Experience a yoga workout experience and a story at the same time. The theme for this week has yet to be determined, but will be posted on the YogaQuest meetup in the link, so be ready for anything! This event costs $15. When: Wednesday, October 10th at 3:00 p.m.
Help keep one local bastion of classic, revival, and cult cinema vibrant with this fundraiser event at Up-Down. For the evening of October 10th, proceeds from video-game token sales will go to support the Trylon. So if you are a classic-film geek, a classic-video-game geek, or a little bit of both, come on down, have some fun, and support a great local resource. When: Wednesday, October 10th at 4:00 p.m. (for the VIP preview) or 5:00 p.m. Celebrate Minnesota’s first Lao-American picture book with this release party for When Everything Was Everything. The book, written by Saymoukda Duangphouxay Vongsay and illustrated by Cori Nakamura, is a love song to the Lao diaspora, survivors of the Vietnam War, and the city of Saint Paul. The event will feature readings, an artist talk-back, and food from Soul Lao and cotton candy from Spinning Wylde. The celebration is free, but there is a $50 VIP preview event including a champagne toast and a raffle for original art. When: Wednesday, October 10th at 7:00 p.m.
Books & Bars is an “open public book club show” hosted and moderated by Minnesota Public Radio senior producer Jeff Kamin which provides attendees with “a unique atmosphere for a lively discussion of interesting authors, fun people, good food, and social lubrication.” The book being read and discussed this month is Justin Cronin’s The Passage, a novel about the apocalypse, post-apocalypse, and vampire-like beings, and is soon to be adapted for television. The Passage is a much-lauded novel, earning praise from horror greats like Stephen King. When: Thursday, October 11th at 6:00 p.m. The Science Museum of Minnesota will be presenting a night straight out of a science-fiction convention. This special Social Science event will focus on fantasy and sci-fi fun, and will give you an opportunity to swing Thor’s hammer, meet Twin Cities Geek people, and more. Costumes encouraged! Social Science is 21+, with tickets going for $18.95 for non-members. Come to GlitchHQ on the second Thursday of every month for an open game of Dungeons & Dragons (the RPG that started it all, from Wisconsin’s Gary Gygax and Minnesota’s Dave Arneson) or Mouse Guard (imagine Redwall as an RPG), welcoming new and experienced players alike. The game is played in an open or sandbox style, so don’t worry about missing individual sessions for overarching story—just show up, roll up, survive, and level up! Materials and rules provided. When: Thursday, October 11th at 7:00 p.m. When: Thursday, October 11th at 7:45 p.m.
Raise a glass to local history at Waldmann Brewery and Wurstery, a local purveyor of beer and wurst with a historic flair. This monthly series focuses on specific areas of local history, allowing participants to learn while savoring a pint of beer made in a 19th-century style. This month’s program is “Building for Beer in St. Paul’s West End,” taught by Kristin Anderson, a professor of art and architectural history at Augsburg University. This talk will focus on the way that West Seventh was dotted with breweries, biergartens, mansions, and more—all connected to the brewing industry. This is a free event, and registration is handled on a first come, first served basis on their website. When: Friday, October 12th at 6:00 p.m.
Mischief Toy Store in St. Paul invites you to experience some Magic with them this Friday night for this Magic: The Gathering draft event. Entry is $15, and all players will receive prizes, including a “fancy promo card.” This weekly event is limited to 24 players and typically lasts until about 9:00 p.m. All skill levels are welcome. Mischief Toy Store hosts other events throughout the week which are also shown above. When: Friday, October 12th at 6:30 p.m.
Tabletop-gaming geeks in the northwest reaches of the Twin Cities metro have a monthly home at Wright County Geeks Tabletop Gaming. This event is held at the Buffalo Community Center, and will play host to great tabletop-role-playing games like Dungeons & Dragons and others. Come check it out if you’re curious about RPGs or are looking to make new gaming buddies. When: Friday, October 12th at 7:00 p.m. This monthly club looks at films and their literary inspirations. Each meeting begins with a bit of social time, then at 7:30 p.m. the movie screening itself begins. Per the event listing, email club organizers for further information. Continue the celebrations of one of the earliest and most impactful works of science fiction with screenings of Frankenstein, Bride of Frankenstein, and Son of Frankenstein throughout this spooky weekend at the Trylon. See what 1931’s audiences saw, and what an almost-90-year-old interpretation of The Modern Prometheus means to a 2018 audience. Tickets are $8. When: Friday, October 12th at 8:30 p.m. When: Saturday, October 13th at 10:00 a.m. The 18th-annual Twin Cities Book Festival is upon us! Book geeks rejoice for this showcase of all things literary, with local publishers, local talent, great guest speakers, and above all, BOOKS! Admission and parking is free, as are Metro Transit rides to the fairgrounds. This is a great opportunity to see intimate conversations with special guests like the author and musician Dessa, and many more. See the website for a complete schedule. When: Saturday, October 13th at 1:30 p.m. The Rivendell Group continues its monthly discussion series at Southeast Library to study and enjoy myth and fantasy. This month, the discussion will be on Shadows of Ecstasy by Charles Williams, and the paper “Reconciling Magic and Christianity in the Poetry, Fiction, and Life of Charles Williams” by Bernadette Bosky, so be ready for supernatural thrillers and urban fantasy. When: Saturday, October 13th at 6:00 p.m.
Local sci-fi RPG night Saturday Night Space Opera returns with a night of spooky exploration in the mutant-filled, technology-haunted future of Terra AD. Dead Man’s Hand will be run using the Mutant Crawl Classics rules (think Gamma World), and involve an expedition into an irradiated ghost ship. This is a free event, all rules will be taught, and no materials are required—just RSVP on the website to snag your spot. Come on down to Can Can Wonderland for the third-annual fashion show fundraising event “The Purple Ones.” Local fashion designers will be on display, showing their creations inspired by songs from Minnesota’s only legitimate royalty, the late Prince. This is a great chance to see fashion, hear music from Lakame, and enjoy Can Can’s signature craft cocktails. When: Saturday, October 13th at 8:00 p.m. The undead horde descends on Minneapolis for an evening of zombies, music, beer, and more. The Zombie Pub Crawl is an annual event celebrating all things zombie, with musical acts including Alison Wonderland, ASAP Ferg, DJ Diesel (aka Shaquille O’Neal), Snow tha Product, and Twista. Enjoy costume contests, pro wrestling, carnival rides, games, and more. Tickets are $39 for general admission, or $90 for a Very Important Zombie Package. Your ticket is redeemable for a wristband, which you will need to take part in the event. When: Sunday, October 14th at 10:00 a.m. When: Sunday, October 14th at 12:00 p.m. When: Sunday, October 14th at 4:00 p.m.